The first book in the Winterhaven series, Kristi Cook’s Haven is a mystery romance about a 16 year old girl named Violet Mckenna and her journey throughout her new life at Winterhaven. Back in Atlanta, at school Violet was known as a freak because she sees visions of her dad’s murder. But, later she goes to New York with her stepmother Patsy and goes to a new boarding school called Winterhaven. Winterhaven was not just an ordinary school, but a school filled with secrets and students having special psychic abilities or “gifts”. Violet meets a small group of friends and she finally finds a place where she seems normal. At school, she meets the most popular guy in school named Aidan Gray and they start developing feeling for each other. While Violet dated Aidan she noticed he’s keeping something away from her. Aidan has been keeping a secret that none of the students know about and later on revealed that he was a vampire. After that there’s a plot twist where there’s a spin on a tragic event that happens to Violet and Aidan relationship. I would recommend this book if you like mystery, paranormal, romance, and friendship involved. I like the build up towards the middle till the end and it has an interesting plot twist involved. If you like the book Twilight, then this is a spin on that book with a different plot twist that involves vampires and a bit of werewolves. In this book, you can see the journey Violet has taken in her stay at her new school and getting to know her new friends. There is a sequel to this book called Mirage. 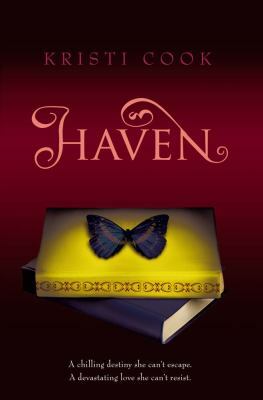 Haven, and the rest of the Winterhaven novels by Kristi Cook are available for checkout from the Mission Viejo Library. This entry was posted in Book Reviews and tagged boarding schools, mystery, orphans, paranormal fiction, romance by itsvanessa81. Bookmark the permalink. This sounds really cool and interesting! I’ll check out the series.